HP 4200 MICR Toner - Q1338A MICR - For use in HP LaserJet 4200, 4200dtn, 4200dtns, 4200dtnsl, 4200n, 4200tn printers. Page Yield: 12,000 @ 5% coverage. Premium New Modified HP black Q1338A MICR toner cartridge used for check printing in HP LaserJet 4200, 4200dtn, 4200dtns, 4200dtnsl, 4200n, 4200tn printers. 12,000 page yield. 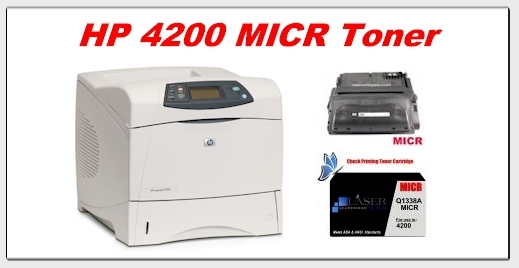 You have found the best source of * HP 4200 MICR Toner * for use in all HP LaserJet 4200 Printers. What's the difference between Premium New and Compatible Cartridges? Premium New cartridges are brand new cartridges modified with MICR toner. We take a new cartridge, remove the original toner, replace it with MICR (magnetic) toner made specifically for that model, and post test to insure proper operation and MICR signal strength using ANSI standards. Compatible cartridges are remanufactured cartridges. Go back to the HP MICR Toner page.